A24 releases The Children Act on September 14th, 2018 at Angelika Film Center. NYC MOVIE GURU: What was the process like to decide what to omit from the novel? Richard Eyre: We talked about the different processes of a reader's response to a novel and an audience's response to a film. There's a much greater requirement for a pulse and a momentum---a different dynamic all-together---for storytelling in a film than storytelling in a novel. So, that was our starting point. We just took it from there. I couldn't say specifically what we decided to leave out, but it was all sort of through the filter of how you would perceive the story. Once you get into the later stages of editing and you're deciding whether to cut a second or two or a few frames to tighten it and make it more exciting, I guess you can say that the paramount concern is to make it constantly involving so that the film always keeps the audience engaged and asking questions about where it's going to go next. So, you kind of do it in parallel. The urgency of the storytelling becomes the principal concern. NYC MOVIE GURU: What was the process like to decide how much exposition to include in the film and how to include it organically? RE: That took quite a lot of time in the discussion between novelist/screenwriter Ian McEwan while he was writing the screenplay and also in the editing---the ordering of the scenes and how you got into the story. Also, how we went from the interior, private life to the public world. I wanted that initial cut to be quite explosive, so it was just playing around with those. It took quite a lot of time in the editing process. NYC MOVIE GURU: How challenging was it to integrate comic relief into The Children Act? RE: I wouldn't see it as a matter of integrating it. It's part of the whole business of being human. We're kind of ambiguous---we don't go in straight lines. People are sometimes, essentially, comic even if they're not aware of it. So, I suppose that it comes down to the way that I look at the world. 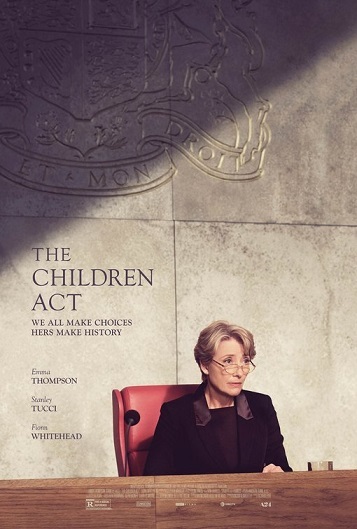 NYC MOVIE GURU: The Children Act has many powerful scenes of silence and nuance. How important is silence and nuance to you as a filmmaker? RE: For me, nuance is everything. Somebody said to me the other day that I made a French film---meaning that it sort of disobeys the unwritten laws of American movies. It allows for silence and for reflective passages. I like it. That just happens to be what I like about films. So, it's just a reflection of the taste of the filmmakers. NYC MOVIE GURU: Which scene(s) do you think are the emotional center of The Children Act? RE: The two scenes that I'd say are part of the emotional center are the first meeting between Fiona and Adam in the hospital and then the scene when Fiona breaks down and cries at the end. NYC MOVIE GURU: When Fiona cries during that scene, do you think her crying is a strength or a weakness? RE: It is a strength that finally she allows herself to be utterly vulnerable. Surely, that's an advantage as opposite to sitting on her feelings and repressing them which she does throughout the film until that point. NYC MOVIE GURU: What do you think is the purpose of struggle in life? RE: I guess it's because we can't do anything else. If you resolve struggle---I guess that that's surely the appeal of religion which is that you absolve yourself of struggle by giving yourself up to a faith--if you don't, then life is a struggle because it's not neatly resolved. NYC MOVIE GURU: I believe that there is a villain in The Children Act---it's a silent villain: leukemia. Do you agree? RE: That's a very, very shrewd way of looking at it. NYC MOVIE GURU: Even though Fiona's husband, Jack, has an affair, I don't think that he's a bad person. What do you think? RE: He's not a bad person. I agree with you. I don't like to divide the world into good and bad. The world in its humanity is a tremendous, massive and messy collection of ambiguous people. NYC MOVIE GURU: You're very good at finding actors who have charisma. How would you define charisma? RE: Charisma is a unique capicity and set of characterists that stand out and are projected. Those characteristics are, kind of, given by birth, I think. NYC MOVIE GURU: What is a grown up? Do you think that anyone ever fully grows up with nothing left to learn? RE: From my perceptive, at the age of 75, the answer is No. NYC MOVIE GURU: Given her profession as a judge, Fiona spends most of her time judging others, but how good of a judge do you think she is when it comes to judging herself? RE: I don't think that she's at all a good judge of herself. She's kind of appalled at herself when she does reflect on herself. NYC MOVIE GURU: Which film do you think would make for a great double feature with The Children Act?